She walked into our very professional business meeting, one kid on her hip, the other, hand-in-hand. I was sitting attentively listening as the speaker effortlessly communicated the vast array of financial services we would be providing to our clients. My trusty Mac at my feet, just in case I got the urge to type out some notes. Surrounded by degrees, licenses and entrepreneurs, she made her way among the audience and crept to the back to get a seat which ended up being right behind me. She set out to unfold a chair to sit in, even though she needed two free hands to do it. I could see she wasn’t one to ask for help, but thankfully one man in the crowd had the conviction to do just that. He took over the task of unfolding her chair, then made sure she and the kids were situated. I had sized her up during this time; light skin, natural hair, thin frame. I knew instantly her small physical size did nothing to reveal the inner strength she was exuding; the inner strength so common to super moms. Those moms who can carry one kid on their hip, hold one by the hand and engage in business discussions suitable for any executive; the same way she did in that meeting. Those moms who work all day, go to school all night and have breakfast ready for the kids in the morning. Those moms who tirelessly care for their young, working everyday to make sure their kids have even more opportunities than they had in their own lives. So many are single, being both mom and dad, but this particular mom was married…her hubby honorably serving his country by fighting wars in Afghanistan. And while he’s there, making us proud, she’s at home, making him proud. Proud because one of the reasons her kids will be so successful in life is because she exposed them to business meetings when they were barely out of diapers. Maybe they were making up their own little songs during the meeting and even getting too antsy to sit still, but never under estimate the power of the subconscious. I’m sure you know a super mom or two. They never let anything hold them back from accomplishing their goals to provide the best for their child/children. They somehow find the strength and energy to do whatever it takes to meet their objectives and do not allow the title of “mom” to hold them back. That title, in fact, is their motivation. I know that look well because my own mom has it. She woke up everyday, put food on the table, sent me to school and worked all day or night. No matter the shift, no matter the job, she was there. There was always a roof over my head, clothes on my back and food in my belly. It didn’t matter if she had to work overtime or even join the army; she was going to make sure I received the very best. And I did. I hope to be a supermom like her one day. I also hope to have a superdad to help me! But for now, I’ll just admire these stellar parents from afar…and add my notes on them in the margins… next to the ones that talk about me being a savvy business woman. Love the post. 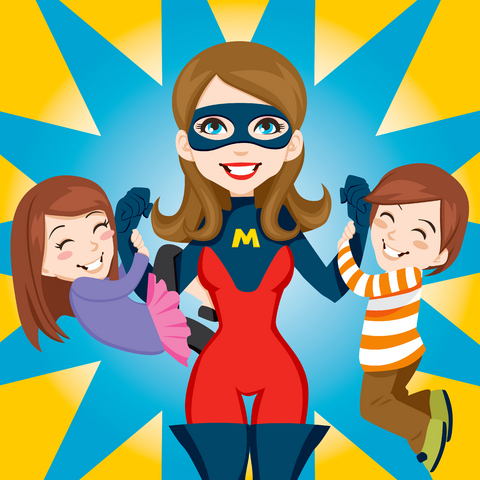 There are so many super moms out there until we are so run down and burned out until sometimes our brains are scrambled and we feel so unappreciated. But we find strength we didn’t even know we have for our kids. To the super dads out there I salute them. Because if there were more there wouldn’t be so many burned out moms. I was writing a blog about my wife and I having our first baby last year. And in looking for a “supermom” image I found your blog. Whoa, what a read! It sure did bring tears to my eyes as I know I have the most amazing woman/wife/mother in my life. She means the world to me. Also when you mentioned your mother is a supermom, I could identify, my mother is a super mom. A mother of 3 raised us, a single mother, yet giving her everything to ensure a great future for us. She worked days and nights, overtime and still cooked and made meals before she went to work, making sure we would have dinner, when she knew she would be working late. I honor and am so grateful for my mother. Today I honor and am so grateful for my wife. She possess this unique power of being a supermom. I am blessed by having the most amazing wife who reminds me daily, that I mined a rare gem that has no name. Gold, Diamonds and any other precious gem could not compare, yet falls short. This rare gem is unheard of and unmatched. Thanks for writing such an amazing post Nicole, it is quite evident that you ill be a supermom someday, as you can see beyond what most people see… you can almost peer into hearts.